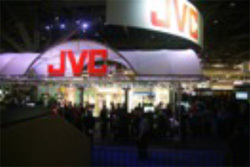 NAB 2012 is over. 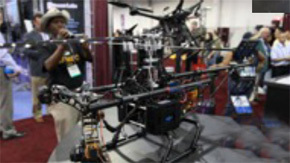 Terry Belanger from Winnipeg Canada (tbelanger@advance.mb.ca) shared with us his NAB 2012 Recap. The slogan for 2012 Yes..we make One Too!! Every manufacturer seems to be able to make a product. You don’t need a large R&D department anymore. But it really helps if you do! 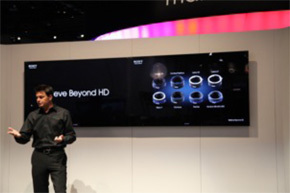 I had two working titles for this recap of NAB 2012. A few days ago I was asked what I thought of the show. As I walked the endless rows of the show it seemed to me that in many of the booths they had something that I had seen two aisles back. So I called this NAB the “ We make that too!” show. Don’t get me wrong. I don’t think this is a bad thing. There is not many of us that wish for another NEW format. Luckily, those days have passed us by. I suppose my concern is if a manufacturer does not have a lot of cost associated with a new product then what would their commitment be over a long term? Having new models every year is OK . Having a product completely discontinued can be frustrating. For Video we have two basic formats( MPEG 2 and MPEG 4 ) and all the variations in between. Most broadcaster use MPEG 2 because it is universally compatible. Many cameras use MPEG 4 because the files are smaller. Almost every camera manufacturer has at least one camera that outputs in RAW option. ( less compression, higher quality and bigger files) With my Canon I shoot JPEG to make my photos viewable by anyone and Raw if I want to do more processing on my laptop. 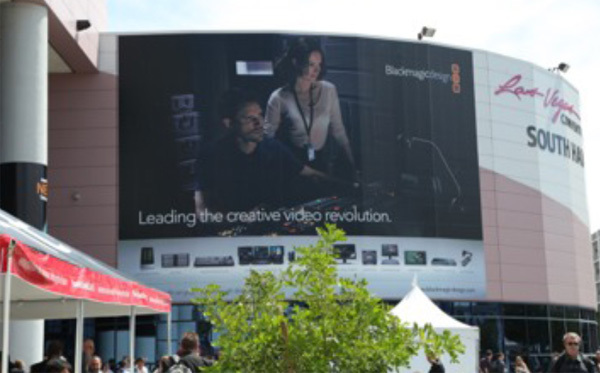 Again the biggest booth at NAB. Not a lot of new products. More a refinement of what they have. It was difficult to get a demo in their booth. You had to book a day in advance. It was that busy! 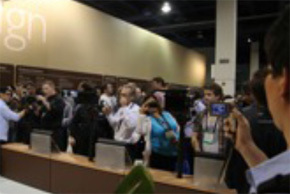 Even Thursday that is NAB’s slowest day the booth was busy. As usual they had lots of WOW. 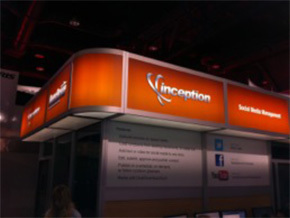 The biggest wow to me was a product called INCEPTION. A 200” glasses-free 3D display with 200 projectors creating the image. What I did not see was a lot of 3D. The 3D I did see was very good. Sony had a display where you did not need to wear 3D glasses. I am not saying that at next year’s NAB but within the next 2 to 3 years you’ll be very impressed with how 3D has matured to a useful format. I took the time to view a Video that was in the RED booth. They had no cheesy 3D effect. It was a short SCI-Fi video that looked good in 3D. I was not there to appraise RED’s video quality or any 3D production. I waited 30 minutes to see a LASER projector. 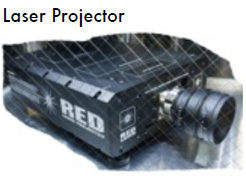 Was it the best projector I ever saw? NO! Was it super bright? NO. But at $10,000 and a life of 25,000 hours before you need to change the emitter .... If it is called the emitter. That is 5 x longer than what bulb projector last will last. I lost count of how many booths had a LED panel of some sort. That technology just gets better and better. I have stopped recommending any incandescent lights of any kind. Three NAB’s ago I found a company called Comer. I am continually impressed about the quality of the product. They brought with them their product engineer. He asked how they could make their product better and more useful. 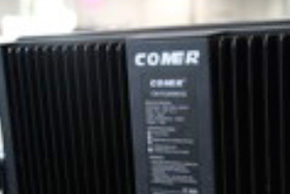 One of my tasks for this year NAB was to search out more Chinese companies like Comer. The Chinese (at this point) don’t market leading edge technology. They see something and make it better or cheaper and sometimes both. Technology seems to be still North America, Japan and Europe. One of my tasks for this year NAB was to search out more Chinese companies like Comer. 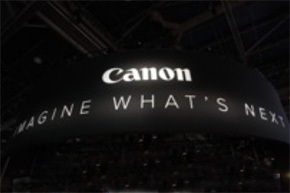 It would be interesting how many companies displaying at NAB had a DSLR accessory in the booth. Companies that made adaptors so you can use a DSLR to shoot better video I found American companies European Korean many Chinese and even a few from Canada. I still don’t believe that DSLR are the best choice to shoot video. I own a Canon 5D(Mk2) and I have seen remarkable video the camera can capture For day to day video use I’d pick and use a video camcorder. One like the Sony NEX-FS700. 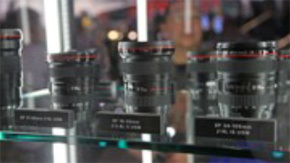 ( more about the FS-700 later) I over heard a comment inside the Canon booth commenting on grips. The comment was about all the gear you needed to add to a DSLR to shoot video. You have the basic plate to hold the camera. 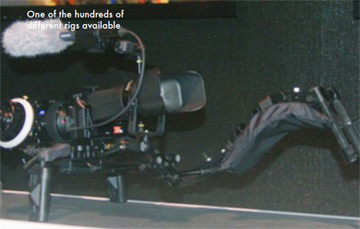 Add one or two arms to hold the grip add an arm to hold the monitor and rails for a Matte Box. Maybe a follow focus just to be safe. Don’t forget an arm to hold an audio recorder. Add a power adapter so you can power it all off of one battery. One last thing, grow two more arms so you can operate everything without hiring an assistant. Give yourself 20 extra minutes to set-up adjust, connect and test everything. the south hall Black Magic crowds were 4 deep most times. In the north hall I think Ross was the busiest. For those of you that have not been to NAB. The Las Vegas convention center has 3 Main hall with the south hall having two floors. There is over 2million square feet of space to cram product in for you to see. I saw several manufactures that had power splitter for batteries. The 12Volt input from a battery got stepped down to 7.2V. for the camera then an outlet for the monitor and the light and for an audio recorder. The IDX is one I found that is well designed. I do believe the days of 1/3” camcorder are limited. They will continue as lower end cameras. I do believe that Sony will keep one or two around for years to come. The Large size sensors will be the dominate form factors going forward. Sony introduced their second camcorder in the NEX-FS line. It is called the NEXFS700. I heard lots of positive comments about the new camera. Like the FS-100, it’s imager is 35.mm in size. The two major additions over the FS-100 are Super slow motion (that Sony calls over and under cranking) and an adjustable ND filter built into the camera. One of the info slides I saw about the camera was the fact that most lens can be adapted to work with the Sony. I saw adaptors for Canon, Nikon, Olympus, Pentax and others. Sony expects the camcorder to be available in June. In the future they will release a firmware upgrade so the camera can output 4 K.
I was a bit surprised to see a PMW-100. A lower price1/3” CMOS size sensor camcorder. It will also output 4:2:2 at 50 Mbs. This camcorder will have a street price of $4600. Broadcaster are not buying DSLR to shoot news. Camcorders with 1/2” and 2/3” will be here for a long time. Sony tells me they had near 20 new products in their booth. new camcorder for quick and easy shooting. The quality of these cameras surpass what broadcasters output. 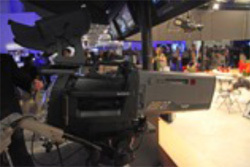 Broadcasters want products that are quick to use. I can see that one day soon some manufacturer will have a 30 Pin on a camcorder. (the iPhone Port) So it can capture of both High quality and be able to stream straight from the camera and use a wireless network. I saw inside the Sony booth a camcorder hooked up to 10 phone to stream instant High quality video. add to my workflow while in photoshop. 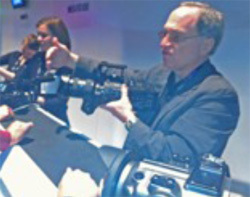 At NAB I saw a few external recorders AJA had one so did Atom, CineDeck, Convergent Design and Black Magic. When you capture beyond 2K or want to exceed 50 Mb., you need an external recorder. I was impressed at what I saw at the Roland booth. If you remember what, I commented about Roland last year, I said,“Not bad for just an audio company” They had a sample switcher from Japan that was a smaller version of their flagship switcher V1600. It is going to be called the V-800. (surprised name). I was also impressed with their VR-5 and new VR-3. 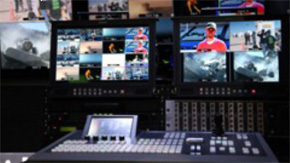 These switchers were designed to make it so easy to stream live video over the net. We are proud to say we are now a Black Magic dealer. We are planning to use Black Magic in the new Stadium build we are working on with the Blue Bombers. I mentioned earlier we deal with Comer. They will be introducing a bright panel with DMX control this summer. around inside that shot and use only what the need for their feed. You could have maybe 3 higher resolution pool feed and get 8 or 9 HD feeds of a game or event. What some called 1080I is 1K to others To a Broadcaster, they call 1080P, 3G. Others call it 2K. 4K sensor has 4096x2160 pixels. Not all CMOS sensors are the same. Sony sample all colours (on the F65) equally. Other read 50% green and 25% for red and blue. 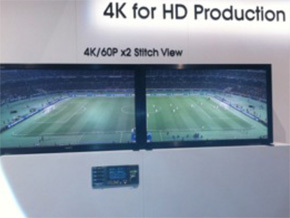 That is called the 4K Bayer sensor. NHK, BBC and the Olympic committee is planing to shoot the opening and closing ceremonies of the summer Olympic in SHV (Super Hi-Vision, that 8K on steroids) that 16x more than HD. Don’t forget the 22.2 channels of Audio. I just read some interesting number this weekend. If you think that 4 K is the resolution you need. Multiply that by at least 3 to have secure back-up. If you are doing 10 hrs of shooting. That would be 30 TB of storage. The broadcast show is not just for broadcasters. It is for nearly 100,000 people from all over the world interested in Video of some sort. 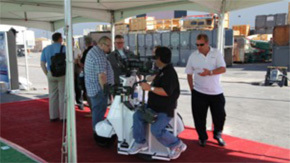 I look forward to NAB next year April 8 -11 (my legs have just stopped hurting from this year). I tend to be geeky about technology and like to see what is coming next. I also like the people I meet there. Yes: Specification are important. It is the people behind the product that makes the product great.